Darcy vs. Bennet #25 on Amazon’s Regency Romance Bestsellers List! Thank you to all my loyal fans who bought Darcy vs. Bennet right out of the gate. It is now #25 on the Regency Romance Bestsellers list for Amazon! 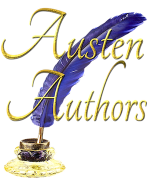 Darcy vs. Bennet received 4.5 (out of 5) stars from the Jane Austen blog JustJane1813! The post also features a giveaway of the book. New Novel Darcy vs. Bennet is Live! My new novel, Darcy vs. Bennet, is live on Amazon and Smashwords! It’ll be up on BN.com, Kobo, Apple, etc. in a couple days. And the paperback version will be available soon. Cover Reveal for Darcy vs. Bennet! Here’s the cover for my latest variation, Darcy vs. Bennet. I was pleased with how it turned out. The book should be out soon (hopefully within the week depending on how things go). I’ll keep you posted. Here is an excerpt from Darcy vs. Bennet, my upcoming P&P variation (a full length novel set in the Regency). It’s not available yet, but hopefully will be in a few weeks. This excerpt is from near the beginning of the novel. At a masquerade ball, Darcy and Elizabeth meet for the first time, but each is unaware of the other’s identity. Darcy had barely taken three steps when he saw a vision. Clad in a pale yellow gown, the woman’s figure was light and pleasing. Lush curls of dark hair piled high on her head, intertwined with tiny flowers. Instantly Darcy knew he had not encountered her before. She was not moving or conversing with anyone; in fact, she seemed a bit lost. When Darcy stepped toward her, her eyes flashed up to his, and his breath caught. Set off by the pale yellow mask, her eyes were a vibrant blue he had never seen before. There was something about her…as if he knew her already…which was ridiculous since he had never met her before. Without a conscious decision, Darcy took several more steps toward the mystery woman. She had turned her face away and was now scanning the crowd. Seeking another man? He felt a twinge of unease, which was ridiculous. He knew nothing about this woman. A crease appeared between her eyes, and her mouth tightened. Was she in distress? “May I be of service, miss? You appear uneasy.” What a ridiculous thing to say! Surely he could think of a better way to introduce himself to this vision of loveliness. “Oh. So I have been abandoned.” Her lips quirked into a half smile. She sees her friend’s abandonment as a cause for amusement rather than resentment, Darcy noted. “As have I. Perhaps we may be abandoned together.” How did such flirtatious language emerge from his mouth? Usually he had no facility with words. Perhaps the mask offered him some kind of license? But her clear blue eyes held his in a captive gaze. No, it was her. Something about this woman stirred feelings deep so all he saw—all he could see—was her. The rest of the world simply fell away. Darcy could not prevent a laugh from bursting forth. At the beginning of their conversation he had suspected she might be unaware of his identity, but now he was sure of it. No woman ever dared to banter with Fitzwilliam Darcy in such a way; they were too eager to compliment his figure, his features, his clothing, his horse…and anything else he possessed. Every exchange with a marriageable woman was colored by awareness of his fortune—except this one—and it was delightful. How had such a woman found her way into the Berwicks’ masquerade? He restrained an impulse to take the woman’s hand; he did not know her. “Very well, will you promise to dance with me if I promise not to purloin your reticule or jewelry?” As he said this, he realized she possessed neither. How odd. When Mary Met the Colonel – New Novella Now Available! My new Novella, When Mary Met the Colonel, is now available on Amazon for Kindle! The print version and copies in other stores will be available soon.